Lia’s son Adam has disappeared whilst on a world trip. His whereabouts at the time of his disappearance are not known exactly, but he may have been in Djakarta when it was bombed. Lia is in a state of anguished limbo not knowing if Adam is dead or how he died or is possibly alive and suffering in the hands of kidnappers. Lia turns to the comforting words of a scatty spiritualist for solace. Lia’s sceptical husband Nick is concerned for his wife’s mental health. Suddenly they receive the news that their son has been found. They eagerly wait to greet their son, only to find that a young man, allegedly suffering from amnesia and scarred after an accident, comes into their lives in possession of Adam’s passport and personal possessions. Lia invites him to stay, against Nick’s wishes, hoping to learn more about Adam’s whereabouts. The young man becomes increasingly psychotic and intrusive. His erratic behaviour becomes frighteningly sinister. This is a darkly disturbing piece. WHILE I wouldn't dream of decrying light entertainment, for me live theatre is at its best when it puts you in someone else's shoes. Even if "wearing" them can, at times, be a decidely uncomfortable experience. Imagine if you can, the pain of a parent whose child has gone missing for six long and tortuous months. Lia finds herself in that situation inEnlightenment, Altrincham Garrick's hauntingly compelling penultimate play of the season. She's clinging to her memories of her missing son, Adam, while on other occasions, grieving for somebody who could still be alive. For me, this is Beverley Stuart-Cole's best ever performance on the Garrick stage and, as the liberal Lia, she ensures there's no hiding place for the audience when it comes to Lia's anguish. Things get even more tense and complicated when Lia and her more measured husband Nick (Scott Ransome) take in the dangerously manipulative Adam. He bears a passing resemblance to their missing son, according to Lia, and comes armed with his personal effects. Anthony Morris is quite outstanding as the cruel and vulnerable Adam and we never know if he had any dealings with Lia and Nick's missing boy. Sheelagh Stevenson leaves it open ended in a play that will hold your attention in a vice-like grip from the start. 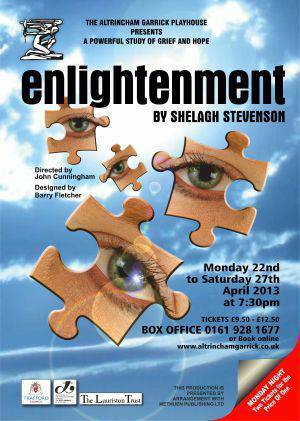 Enlightenment?is difficult viewing at times but it is a long time since a play has affected me quite so deeply, due in no small part to director John Cunningham and a very, very good cast. Do not miss. "Parents mourn son's unexplained disappearance"
Enlightenment. ?Unfortunately, her convoluted style distracts from the main theme of the play - the distress of parents whose backpacking son has gone missing in the Far East. ?This is a compelling theme so why does the writer take us down the blind alley of chaos theory and other distracting diversions? These interventions are, for me, irritating. Surely, parents who fear their child has been killed in a terrorist incident far from home would be unable to think of anything else? My thoughts about the play's style of writing, do not detract from praise for the actors and for Barry Fletchers's minimal set with photographic backdrop showing the 2006 Jakarta bombings and other themes. The key roles of parents Lia and Nick are put across well by Beverley Stuart-Cole and Scott Ransome. They interact perfectly, sharing their grief but approaching it from different angles. Lia clings to the belief that her son, Adam, is alive whilst Nick, who is not Adam's real father, tries, unsuccessfully, to get on with life. ?The way Beverley captures the mother's anguish indicates one of the best performances by Stuart-Cole in her 26 years with the Garrick. Her character turns to a clairvoyant (Carole Carr) for help but her intervention is, to say the least, useless. Then a stereotypical TV reporter (Kate Millington) attempts to take advantage of the situation, again leading them up a blind alley. The only incident which provides the slightest thrill (this play is dubbed a "psychological thriller") is the unexpected appearance of a young man from Thailand who has lost his memory but who obviously knew Adam. Anthony Morris who plays him brings the play to life in the second half. ?I expect good plays to have a clear beginning, middle and end. In this one, the beginning has too slow a pace and the end leaves you in limbo. It is the middle that stands out when the couple are told their son is alive and arriving at the airport. Lia's expression of delight is unforgettable. ?In the final scene, the parents embrace. Is it because they are happy or because they are sharing their sadness? And then the telephone rings. Could it be Adam? ENLIGHTENMENT starts with an intriguing situation: Adam, a 20-year-old backpacker vanished six months ago during a round the world trip. We watch as his mother and stepfather agonise over the mystery of his disappearance. Could he have been killed in a bomb explosion in Jakarta where he was last heard from, or is there a chance he is still alive? Beverley Stuart-Cole delivers the strenuous grief stricken Mother, Lea, with intense believability, her performance is both compelling and heartfelt. Beverley excelled and treated us to a superior performance worthy of a professional stage. John Cunningham has stunningly directed this contemporary piece, the balance is accurate and the tone of the work was impeccably communicated via his dream cast. I very much enjoyed Carole Carr?s Mrs. Tindle, she, like Alan, added some welcome light relief and she delivered the part at an accurate level. I imagine this to be one of those roles which can often be pushed too far for the laughs, Carole and John had kept a check on this which, if pushed more towards the comedy, however tempting, would?ve thrown the entire play off course, kudos for this! After some time away at university, Anthony Morris makes a triumphant comeback to the Garrick with a knockout performance. He plays the troubled individual with such calibre and expertise. A very thought provoking enactment from this young man - who I hope is back to stay! Excellent support was on hand too from Scott Ransome as Nick who?s highlight was undoubtedly the scene with his ?Lovely, Lovely? outburst at Mrs. Tindle. Kate Millington had all the right qualities as Joanne and gave a worthy interpretation of this nuisance (who turns out to be quite lovely). There?s a twisted emotional knot in the very guts of this intensely likeable and relentless drama, another exciting and audacious choice from the play selection committee!